This 19km trek is New Zealand’s best day one day walk. 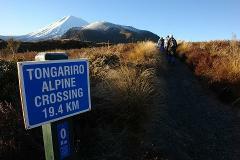 The track leads up to the saddle between Mt Ngauruhoe and Mt Tongariro and then diverts over Mt Tongariro. Be guided by the best at Adrift. We guide the Tongariro Alpine Crossing all year and every day when mother nature allows us a safe and enjoyable passage. Winter Crossings are from 1 May - 31 October or when snow and ice are on track. 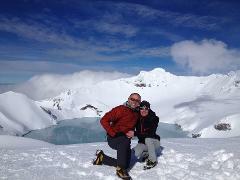 An exclusive guide for 2 people on the Tongariro Alpine crossing. With the Milky Way at your fingertips and shooting stars streaming in the clarity that only the pre-dawn can achieve, come and see the sunrise at Red Crater and enjoy breakfast alfresco. This fantastic evening option is ideally suited to maximize an allocated travel day to or from Tongariro, or for those who would like to experience the volcanic terrain but are limited on time, at this stunning time of day. If for whatever reason you are unable to spend the day walking the Tongariro Alpine Crossing but want to enjoy the beautiful landscape of the Tongariro National Park then the 4 hour 1/2 day Tongariro Volcanic tour is for you. Join Adrift Tongariro on a guided hike to the top of Mt Ruapehu, the largest of the three volcanoes in Tongariro National Park. This is a great hike and does require a good level of fitness. Join Adrift Tongariro on an Exclusive guided walk to the top of Mt Ruapehu, the largest of the three volcanoes in Tongariro National Park. This is a great walk and does require a good level of fitness. 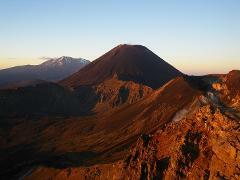 Join Adrift Tongariro on a guided walk to the top of Mt Ngauruhoe, one of New Zealand's most active volcanoes. Mt Ngauruhoe found recent fame as Mount Doom in the Lord of the Rings. 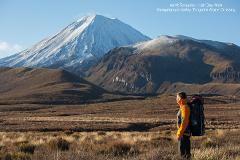 The Northern Circuit is a 3-day tramp starting on Mt Ruapehu and encircles Mt Ngauruhoe. This trek is a good way to enjoy the Tongariro National Park at a less energetic pace, whilst avoiding the crowds of the Tongariro Alpine Crossing.